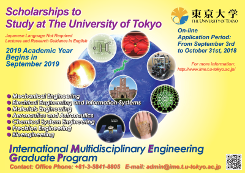 The International Multidisciplinary Engineering (IME) Graduate Program welcomes exceptional students from all over the world to study at the University of Tokyo. To meet the increasing demand for interdisciplinary/multidisciplinary education in engineering, we expanded the International Graduate Program in Mechanical-Electrical-Materials Engineering (the MEM program) to the IME Graduate program in 2014. IME includes seven departments: Mechanical Engineering, Electrical Engineering and Information Systems, Materials Engineering, Aeronautics and Astronautics, Chemical System Engineering, Precision Engineering, and Bioengineering. All lectures are given in English. In 2015, 48 students enrolled in the IME Graduate Program. Since the launch of the MEM program in 1999, 440 students, from all over the world, have graduated from this program. They went on to become valuable collaborators with us and significant contributors to the advancement of the fields that they studied during their participation in the MEM or IME Program. 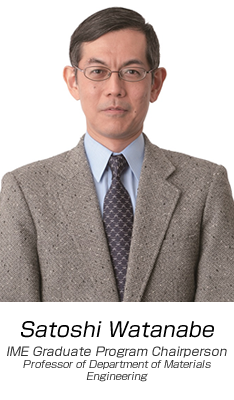 Considering the record of success of the MEM and IME programs, and the fact that the Graduate School of Engineering at the University of Tokyo stands at the forefront of innovation from fundamental researches to the most advanced applications, we believe that those who study in the IME Graduate Program will contribute greatly to the sustainable development of the world in the 21st century. I hope that all of you will enjoy the IME Graduate Program and that this unique experience will become an important foundation for your successful career.